Are you looking for an innovative way to enhance your marketing campaigns? Ready to showcase your brand to the expanding universe of mobile users? Do you have a fantastic deal that just needs guaranteed views to succeed? CellAd and AdKoin are here to help! We are excited to share with you the AdKoin global subscriber network. If you are an advertiser ready to deploy targeted, rich media mobile campaigns our mobile advertising platform gives you the power to reach new customers world-wide. Advertising with CellAd is easy through our self-service portal that shows real-time reporting. Our partners enjoy both high click-through rates and strong audience response. Check out some of our high-performing campaigns at the Case Studies page. To receive our New Mobile Advertiser Guide please fill out the information below. 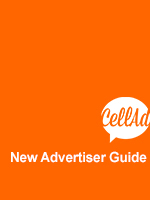 The New Mobile Advertiser Guide contains information to help you register at the CellAd portal. It includes a special discount code for your first campaign, step-by-step instructions to get started, and pricing details. All tools to help optimize your mobile marketing strategy by targeting key audiences within your budget!